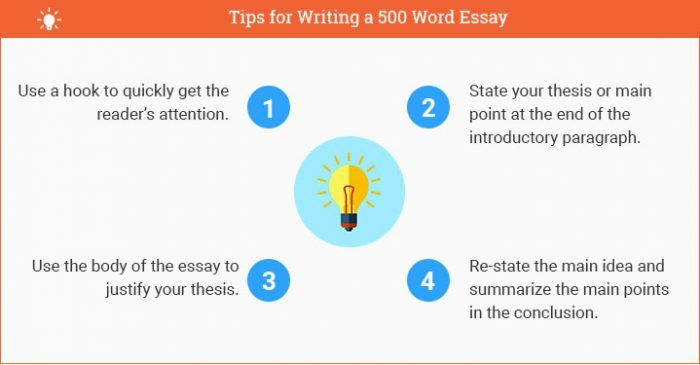 The 500 word essay is one of the shorter types of essays a student might be asked to write. Coming in just under 2 pages in length (approximately 300 words per double-spaced page), this short essay can typically be written using the 5 paragraph model. This model has a one-paragraph introduction, a 3-paragraph body, and a one-paragraph conclusion. Each paragraph should be about 100 words long—or roughly 5 sentences—and each paragraph should have a main idea or topic sentence. To give you a sense of length, this paragraph right here is almost exactly 100 words long. How long is a 500 word essay? Just over a page and a half and just under 2 pages, double-spaced, this short essay is not intended to serve as an in-depth analysis of facts or as a substantial exposition on a particular subject. Instead, the focus of the 500 word essay is usually restricted to a specific topic and is commonly reflective in nature—i.e., the writer is often encouraged to give his thoughts. Sometimes you’ll need to back up claims with outside references—so just because it’s short, doesn’t mean you won’t need to do research (and if you need help with that, try out our research paper writing service). In many cases, this type of essay is used to facilitate discussion. Student responses to other students’ posts, for example, will fall between 300 and 500 words. Teachers commonly like to see students’ thoughts and reflections supported by references to the reading material—so it’s a good thing to refer to the books, articles or videos that have been assigned in class. The 500 word essay should be short and sweet—i.e., to the point. There are simply no words to waste by getting into digressions. The first thing to do is to identify the main idea of the essay. You can give one or two brief background points to contextualize it, but get your thesis statement in the paper right away. This can sometimes be accomplished by asking a question and then answering it. We’ll show you what we mean in the example below. Following the introduction, devote your first body paragraph to your first point. This point should support the thesis statement that you delivered in your introduction. This paragraph should be about 100 words long and should consist of the topic sentence as well as three or four supporting sentences. Use transition words and phrases to introduce the next body paragraph. This paragraph should be used to support the thesis as well, but it should have its own topic sentence as well. It should focus on a new idea or piece of information not covered in the first body paragraph. However, it should also refer back to the main idea of the paper. A third body paragraph should follow so that there are 3 total body paragraphs, each one acting as a support for the essay’s thesis. Finally, a concluding paragraph should be written, and it should re-state the main idea of the essay in new words and briefly summarize the main points that were utilized in the body. There is no rigid one-size-fits-all template for writing the 500 word essay. The format for this short essay may adhere to the 5-paragraph essay format—but it does not necessarily have to. In many cases, your subject will dictate the format. For example, if you are writing a 500 word narrative essay, you might use anywhere from 3 to 7 paragraphs. If you only have one point to make in an expository essay or are comparing and contrasting two subjects, you may use only 2 or 3 paragraphs. The essay should always be titled, with the title centered at the top of the page—no need for bold, italics, quotes or underlines. And no extra spaces between the title and the text! The main thing to remember when formatting the 500 word essay is to double-space the type, use 12 point font—usually Times New Roman, but sometimes Arial is accepted—and follow the general requirements of MLA, APA, Chicago or whatever citation style guideline you are using for the essay. Are school uniforms necessary? In private school, uniforms are often the norm—but in public school most students have the option of wearing casual dress when they come to class. While uniforms may be restrictive and clash with personal preference, they actually do have some good points. For example, it’s one less thing that students have to worry about when they get ready for school in the morning. This paper will show why mandatory school uniforms can actually make life easier for students and schools. First of all, school uniforms can help to eliminate the problem of peer pressure that students often face when trying to decide what they should wear. Considering the fact that not every student has money to spend on the latest trends in fashion, school uniforms offer a less expensive alternative that can eliminate the peer pressure that goes with having to dress according to the latest styles. Students can focus more on studies and less on trying to stand out, fit in, or be respected and admired based on the quality of their fashion statements. True, students who want to express themselves stylistically will have to find another way to assert themselves; however, for the majority of students, uniforms would be a welcome change as there is never a question of having to decide what to wear or fearing that one’s wardrobe isn’t good enough. Everyone is wearing the same thing! Secondly, school uniforms can help to promote a more formal environment in the school. That means students are more likely to adhere to the rules and regulations of the school, as uniforms promote the concept of conformity and regularity—which is good for schools! Uniforms suggest that everyone is on the same page and everyone is expected to show up and do one’s duty. Uniforms encourage propriety, good form and good manners. Uniformed students are more likely to show respect for their teachers than students who are used to asserting themselves, demonstrating their own will and desire in their dress, and showing off. Finally, school uniforms foster school spirit. They help students to identify themselves as members who owe allegiance to the school. They instill in students a sense of belonging and the knowledge that they themselves represent the school. By wearing a uniform that sports the logo or emblem of the school and the school’s colors, the students show that they are willing to reflect the values and mission of the school in their own person. In other words, uniforms help students to stifle their own self-centeredness and be part of something bigger than themselves. In conclusion, school uniforms offer a lot of positive qualities. Students who wear the school uniform are less likely to face peer pressure about their fashion preferences than students who do not have a uniform and must pick out their own wardrobe on a daily basis. They are also more likely to respect authority and the rules of the school, and have school pride. School uniforms might not be to everyone’s taste, but the benefits of having them certainly cannot be denied. 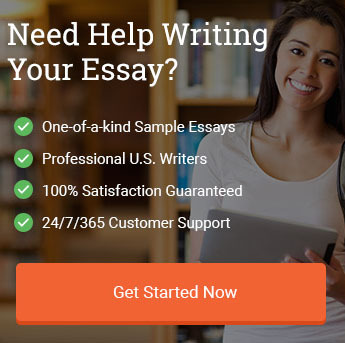 The 500 word essay is a short essay that allows a student to utilize the basic 5-paragraph model to make a point, support it with three brief body paragraphs, and then wrap it up in a succinct conclusion. It can be used in a variety of essay genres. Depending on the subject matter, your essay may deviate from the 5-paragraph model. In some cases you may only have 2-3 paragraphs. In other cases, you may have more. If you have a 500 word essay due and are struggling to find the right approach, try our model essay writing service. It’s easy to use, competitively-priced, safe, and effective. Our writers routinely deliver to clients a completely customized, 100% unique model essay written to their precise specifications. Use our example to help craft your own! Use a hook to quickly get the reader’s attention. State your thesis or main point at the end of the introductory paragraph. Use the body of the essay to justify your thesis. Re-state the main idea and summarize the main points in the conclusion. "How to Write a 500 Word Essay." Aceyourpaper.com. Student Network Resources Inc, 2 January. 2018. Web. 18 April 2019. Student Network Resources Inc. "How to Write a 500 Word Essay." Aceyourpaper.com. https://www.aceyourpaper.com/essay-writing/500-word-essay/ (accessed April 18, 2019).